This is a split LP, with both bands providing a retrospective as material is compiled from many different years. With a record like this you never know where to start. Ok... I will start with Vibravoid. This is totally different from the two main releases many people might be familiar with. The opening and the last track are from the groups first radio sessions in 1996 for Radio Netzkraut and are basically electronic drone tracks. "Mind Decision" is very much like Tangerine Dream’s mid-70s style stuff with a repeated electronic pulse in which some vocals, synthesizer and guitar are layered on top. Very spacey this track. This segues into "Bellflight" which has numerous chiming bells upon which the soundscape is built. These two tracks were recorded in Spring/Summer of 1994. Excerpt from "A Journey To The Sun" is a sequence from a nearly 30 minute track which was the first multitrack recordings that Christian did back in 1993. Sula Bassana starts with an excellent archive track featuring Jodi Barry, who was the female vocalist on the Zone Six studio CD. This was recorded in 1998. A great song with a cool tune and samples, strange percussion, voices and guitar. "Blow That Trip" is next and was recorded while some of the guys from Liquid Visions and Mr. Vibravoid were hanging out in Dave’s kitchen in Berlin in 2002. Strange samples with floating drones and effects. 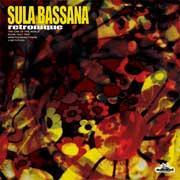 "Nineteenninetynine" was recorded in 1999 and this is probably the heaviest Sula Bassana song with a great dissonant, dark guitar riff which reminds me of Hawkwind or something. I can’t quite place it. The LP ends with "Low Future", recorded in 2002 just after the US aggression against Iraq. This is a great floating space rock track that is very Pink Floyd inspired, mainly by the Richard Wright style keyboard playing. I think it is a great LP but more experimental than either of the bands previous releases. Check it out, if you can! Visit the Sula Bassana web site at: http://www.sulabassana.de.